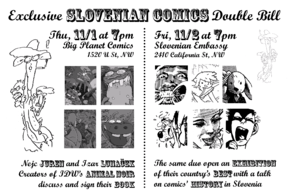 The first days of November will see a double hit of Slovenian comics descend on Washington DC. On Thursday, November 1 at 7pm, Nejc Juren and Izar Lunaček will swing by Big Planet Comics to talk about and sign their book Animal Noir, a comic thriller about a giraffe detective in a world of lion politicians and hippo mobsters that came out with IDW last year. The following day on Friday, November 2 also at 7pm, the same guys will open an exhibition on the vivid history of their own country comic's scene at the Slovenian Embassy, 2410 California Street, NW, 20007. Admission to both events is free and food and drinks will be served. Come one, come all, it'll be wonderfully fun! 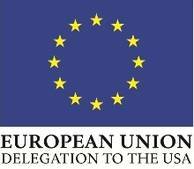 For the Embassy event please RSVP to: events-vwa.mzz(at)gov.si by October 31.